Purified mouse monoclonal antibody in PBS (pH 7.4) containing with 0.02% sodium azide, and 50% glycerol. Purified recombinant human Caspase-9 protein fragments expressed in E Coli. 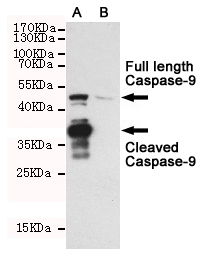 This antibody detects endogenous levels of Caspase-9 and does not cross-react with related proteins. Belongs to the peptidase C14A family. Contains 1 CARD domain. Heterotetramer that consists of two anti-parallel arranged heterodimers, each one formed by a 35 kDa (p35) and a 10 kDa (p10) subunit. Caspase-9 and APAF1 bind to each other via their respective NH2-terminal CED-3 homologous domains in the presence of cytochrome C and ATP. Interacts (inactive form) with EFHD2. Interacts with HAX1. Interacts with BIRC2/c-IAP1, XIAP/BIRC4, BIRC5/survivin, BIRC6/bruce and BIRC7/livin. Interacts with ABL1 (via SH3 domain); the interaction is direct and increases in the response of cells to genotoxic stress and ABL1/c-Abl activation. Interacts with NleF from pathogenic E Coli. Small volumes of anti-CASP9 antibody vial(s) may occasionally become entrapped in the seal of the product vial during shipment and storage. If necessary, briefly centrifuge the vial on a tabletop centrifuge to dislodge any liquid in the container`s cap. Certain products may require to ship with dry ice and additional dry ice fee may apply. Entrez Summary: This gene encodes a member of the cysteine-aspartic acid protease (caspase) family. Sequential activation of caspases plays a central role in the execution-phase of cell apoptosis. Caspases exist as inactive proenzymes which undergo proteolytic processing at conserved aspartic residues to produce two subunits, large and small, that dimerize to form the active enzyme. This protein can undergo autoproteolytic processing and activation by the apoptosome, a protein complex of cytochrome c and the apoptotic peptidase activating factor 1; this step is thought to be one of the earliest in the caspase activation cascade. This protein is thought to play a central role in apoptosis and to be a tumor suppressor. Alternative splicing results in multiple transcript variants. Isoform 2 lacks activity is an dominant-negative inhibitor of caspase-9. 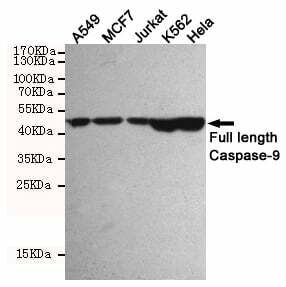 Western blot detection of Caspase-9 in A549, MCF7, Jurkat, K562 and Hela cell lysates using Caspase-9 mouse mAb (1:1000 diluted).Predicted band size:49/37KDa.Observed band size:49KDa. Western blot detection of Caspase-9 in CHO-K1 cell lysate (B) and CHO-K1 transfected by Caspase-9 (A) cell lysate using Caspase-9 mouse mAb (1:1000 diluted).Predicted band size:49/37KDa.Observed band size:49/37KDa. NCBI/Uniprot data below describe general gene information for CASP9. It may not necessarily be applicable to this product. CASP9: a member of the cysteine-aspartic acid protease (caspase) family. Sequential activation of caspases plays a central role in the execution-phase of cell apoptosis. Caspases exist as inactive proenzymes which undergo proteolytic processing at conserved aspartic residues to produce 2 subunits, large and small, that dimerize to form the active enzyme. This protein is processed by caspase APAF1; this step is thought to be one of the earliest in the caspase activation cascade. Alternative splicing results in two isoforms. 1. Results show that mRNA and protein levels of HAX-1 in prostate cancer cell lines were significantly higher and inhibits cell apoptosis through caspase-9 inactivation.